Fitness | Counting my cookies... & Eating them too! Hey gang! I know I’ve really slacked off on the blog posts lately, I will get all caught up soon! Just real quick this morning I wanted to post pics from the before & after of the 30 Day Abs Challenge that I just finished this week. I’ll be honest, I don’t see a lot of difference in the pictures! Although I do see a bit more definition. My overall rating of the “get ripped abs in 30 days” is that I wouldn’t exactly call my abs ripped at this point, so kind of false advertising. I did every work out, never skipped a day. And in the end I just didn’t see as much difference as I was hoping to. However, on the side view, I see tremendous difference – although I’m going to credit some of that to simple “bloatyness” as I believe the before picture was taken in the evening, after dinner and after a full day of eating, whereas the after picture was taken at 7:00 a.m. before eating anything save for a few sips of coffee. But you can see a bit of muscle definition that was clearly not there before. 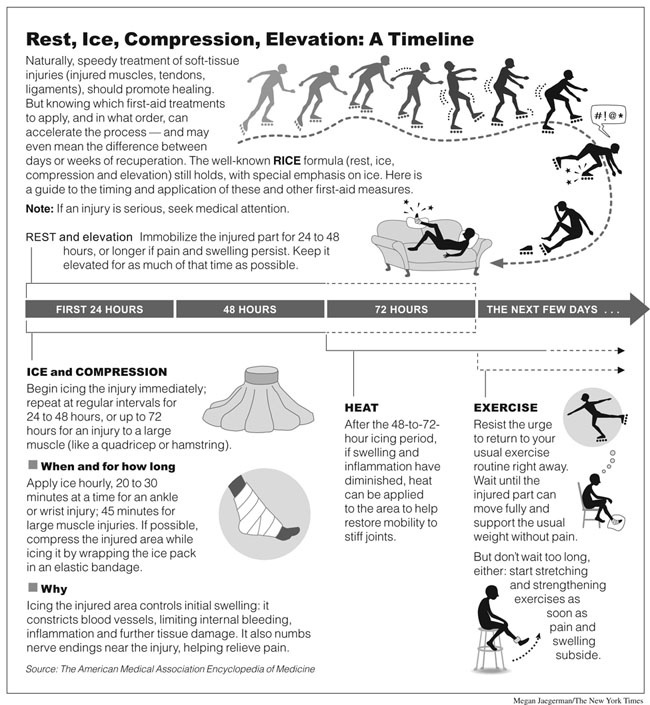 In my last post I talked about the injury I was dealing with in my calf. A few weeks have passed and I haven’t had a chance to sit down and write for a while, so I guess it’s time to do some catching up! I did go to see the orthopedic surgeon / sports medicine specialist that my doctor referred me to. In fact, I was seen by a team of young doctors. An intern, a resident and the surgeon all came in to see me and discussed their thoughts with me. The resident said he was also a runner, so I liked knowing that he understood where I was coming from. They were able to rule out any serious injury. It didn’t appear there were any torn ligaments or pulled muscles or anything serious. The diagnosis was basically overuse / overexertion. Pretty much what I thought, but I was glad to have anything more serious officially ruled out by medical professionals. I’ve reached the age of being practical enough to not want to take unnecessary risks. Basically what happened was that I pushed too much, too quickly in my training. And my body was patient and willing to work with me up to a point. Once I crossed that “red line” my body clearly let me know I had gone too far, that I needed to take a step back, and that it wasn’t negotiable. Even as I sat in the surgeon’s office, with my legs all swollen and sore, my first question was “how soon can I get back to my training?” The team of doctors all agreed I needed to take a little time off from running or walking (for exercise that is, normal every day walking around work or at home was fine), they told me to rest until the swelling was gone and there was no sign of pain anymore. Moving forward, the doctor’s recommendation was to take things very slowly (he was actually impressed when I described the plan I was originally following and how careful I had been, prior to the race training, to taking things slow!) He said I need to focus more on stretching, both before and after my workouts. And he thought it may be a good idea for me to run with compression socks. I have looked around a bit and good running compression socks are pretty expensive, so while I think that may be a good idea for me since I seem to have this tendency toward swelling, I think that purchase will be put off for a while until I am back into running more. Doc was in favor of me continuing my pursuit of cross training like the swimming I’ve been doing, and the strength training, he thought that was perfect. So here is the thing. I am a pretty determined person (read: stubborn). So there is no way that I plan to allow my self to be side tracked too much from my fitness goals. But I will take the smart approach and do everything I can to avoid further injuries. As I mentioned in my previous post , I decided to spend some time working on my upper body and core strength. 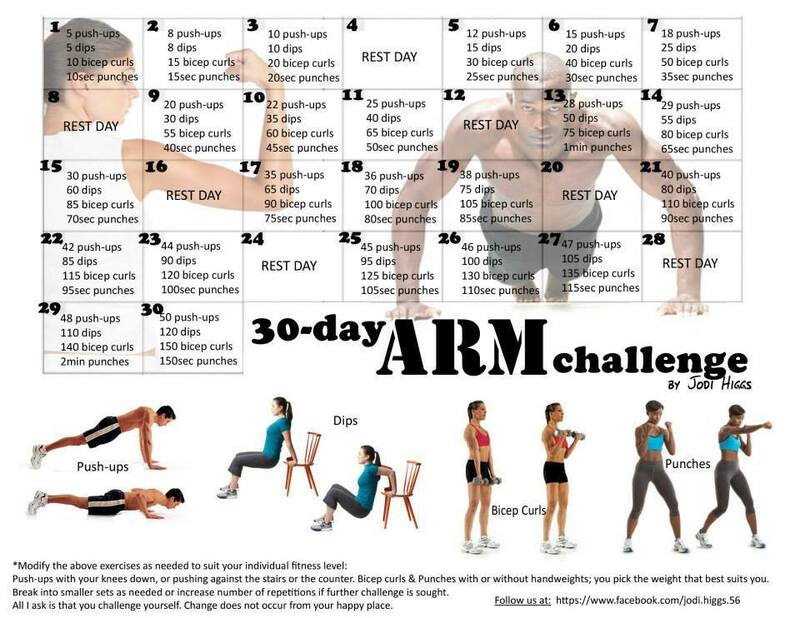 I have begun the 30 Day Arms Challenge and am currently on Day 19. If you’d told me a year ago to do 38 push ups, 85 bicep curls, 70 dips and 90 seconds of punches, in one day, I’d have said there is NO way I could do it. But not only am I doing it now, but this challenge only gets tougher as I progress through the 30 days! My arms have been so sore! But, I am starting to see some real definition in my arm muscles which is pretty exciting, can’t wait to see the results at the end of the 30 days. I will probably work a few sets of these exercises into my ongoing rotation when this is done, just to make sure I keep what I’ve worked so hard for. Looking ahead to the end, it looks kind of intimidating, but as you progress you get stronger so it actually isn’t as hard as it seems like it will be! I also had mentioned earlier that I found a decent core training plan on Runner’s World that I wanted to try. I have worked that in a couple of times so far this month when I had nothing else on my calendar but the Arms Challenge. It’s a pretty short workout and while I’m sure it is effective, I’m not getting a warm fuzzy feeling about it, so I’m probably going to keep looking for some other core strengthening plans that I can keep in my normal rotation. 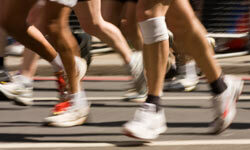 What I also found on Runner’s World is a 7-week walking plan that I decided to follow. This plan is designed for absolute beginners, like someone who just started to exercise. Since I don’t know exactly at what point in my transitioning from walking to running I hit that “red line”, I’ve decided it will be a good idea to just begin at the beginning. There’s no harm in taking a step back to try to do this a better way. The 7 week walking plan includes 4 walks per week. A really short, easy walk on Monday, a little bit longer walk on Tuesday and Thursday and a long walk on Saturday. You get Wednesday, Friday and Sunday off. I like that because on 2 of those off days I can combine my Arms Challenge with core strength training to still burn some calories, work on my strength and fitness, but let my legs rest. And the third rest day I take a break from just about everything and really rest. There’s no specific speed or mileage requirement, so I’m picking back up with where I left off on my speed progression before I went all crazy prepping for the Kona Run. The duration of the walks slowly increases each week, very slowly, which I like. By the end of the 7 weeks I’ll be back up to my 55 minute walks. This week I started “week one” and the long walk on Saturday was only 35 minutes, and the short walk on Monday was only 15 minutes so this felt like a nice easy way to get back into the swing of things after taking 2 weeks off. At this point, all the swelling is gone from my legs and I feel so much better. It felt good to rest for a bit but it also is feeling good to get going again. Part of me just likes to keep doing something so I can keep eating, lol! I had just decided to increase my daily calories from 1350 to 1500 right before the injury, so during my rest time my weight has creeped up a pound or two, but nothing too serious that won’t be taken care of easily as I get going again. If you’re interested in finding out more about these walk-to-run plans, visit The Starting Line from Runner’s World. 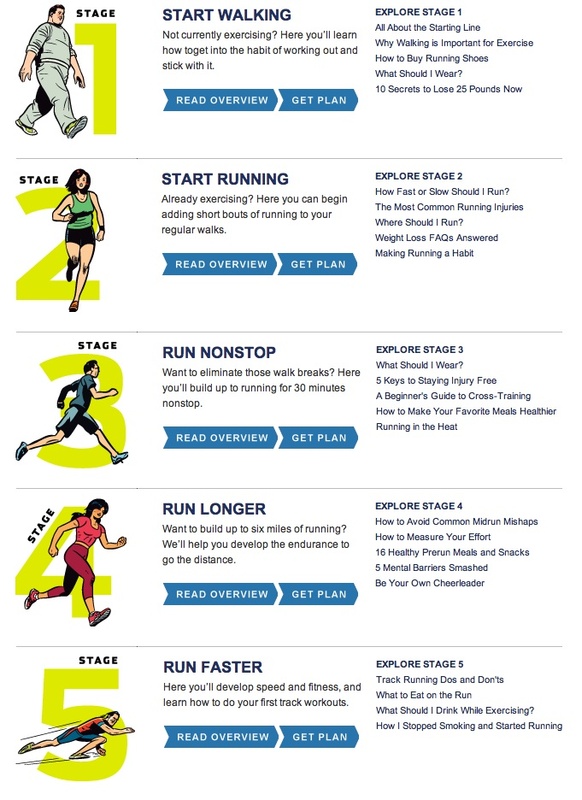 Runner’s World also has other plans to follow and I think I will go right through their progression from basic walking, to walking with some running, to adding more running, to all running. My husband and I are planning on running another 5K race for Halloween, so I’ve got 4 months to get back to a place where I can safely run the race. 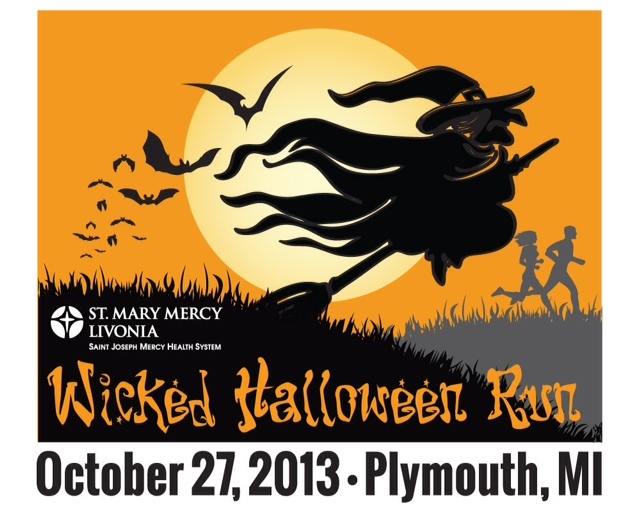 We are going to do the Wicked Halloween Run in Plymouth, MI. So, it is 7:42 a.m. on a Saturday morning. I should be outside running right now. Why, then, am I sitting here in my pajamas, sipping coffee, writing this blog post? I’m glad you asked! It has been brought to my attention (by my body) that I am injured and need a rest from running. I am quite disheartened by this news, but am trying hard to stay positive and be creative about other ways I can stay fit and keep burning calories. Time for one leg squats? A few weeks ago I remember teasing with the girls in my office that I must really have one dominant leg when I run because it seemed like I had built up the muscle in one leg significantly larger than the other. I was frequently noticing while wearing capri-length pants that they would be very tight around my left calf, to the point of discomfort. But they fit just fine around my right calf. One gal suggested it wouldn’t be that unusual to have one foot that I always lead with and that I could actually build up more muscle in that leg than the other. She thought maybe I should consider doing some exercises specifically with the other leg to try to even them out. It sounded somewhat logical, and I didn’t do any further research on the subject. Over the last few weeks I’ve frequently found this situation to be very noticeable and sometimes uncomfortable, but then other times I didn’t notice it at all and it would just slip from my mind. I would occasionally notice tightness in my calves, that one side in particular, and a little tingling and a lot of muscle twitching. I assumed this was just the results of working the muscles hard when I run. This past week on Monday, my left calf was really bothering me while I was at work. It seemed like as I sat at my desk, with my legs dangling down to the floor, my calf was swollen. I kept trying to prop it up on something under my desk, looking for some relief from the discomfort caused by swelling. On my lunch break I even sat out in my car, with my foot propped up on the dashboard for elevation, just trying to get some relief. By Tuesday I started to realize some thing was really wrong here. 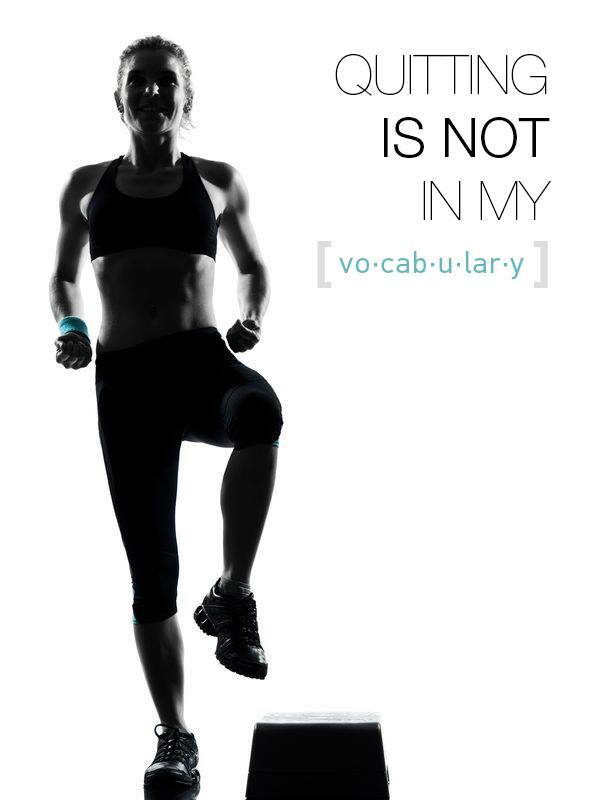 This was not just muscle soreness from vigorous exercise. My left calf was swollen to nearly twice the size of the right leg! And it just felt so tight, and uncomfortable and constant twitching of the muscles. I decided it may be time to see my doctor. To be honest, my mind was zeroing in on ‘worst case scenario’ and I feared it may be a blood clot. I just wanted to hear my doctor say that it wasn’t that. As it turned out, my doctor, upon seeing my swelling and hearing my symptoms, immediately became concerned about the same thing. She told me it was most likely that I had a sports injury, but that the symptoms and risk factors also pointed strongly towards deep vein thrombosis (blood clot) and she wanted to rule that out before pursuing any other options. She ordered me over to the hospital for an ultrasound “stat”! It always worries me when the doctor actually seems anxious and in a hurry for a test. Her staff called the hospital and explained they needed this test done right now, and they sat on hold while the hospital admin made calls to rearrange their appointments to fit me in. Then I went straight over there for the ultrasound. The ultrasound was an interesting process and I have to tell you, it looks a little bit like the moon – inside my leg. 🙂 At the end of it, the technician told me that she cannot give me any results of the test, that the doctor would have to review it and go over the results with me. However, she could tell me that if she had found a blood clot she would not be allowed to let me leave the hospital. Then she smiled and said “And you are going home now”. Enough said, I finally exhaled with relief. A few hours later my doctor called with the official test results saying that the ultrasound was normal and there was no blood clot. That leaves us with the most likely culprit being some sort of tear, strain or other type of sports injury. She referred me to an orthopedic sports-medicine specialist. That was Wednesday afternoon, and with Thursday being the July 4th holiday, I had to wait until Friday to even call them for an appointment. Now I’ll be going in there on Monday to see what they have to say about the situation. At least now that I know I am not dealing with anything life-threatening, I could start treating this like a soft tissue injury even though I don’t know exactly which muscle it is or the extent of the injury. I started immediately on Wednesday afternoon with R.I.C.E. (rest, ice, compression and elevation), coupled with a few doses of Tylenol to help bring down the swelling. How bad is this injury? When will I be able to run again? How much more damage did I do by continuing to run long after being injured without realizing at the time that I was injured? What sort of rehab will I need to do to heal and rebuild my strength? How will I continue my quest for fitness and burn the calories I need so I can keep eating a decent amount without regaining the weight I’ve lost? What kind of exercise can I do that won’t continue to make matters worse in my leg muscles? My biggest fear is that I’ll get lazy and completely fall off the wagon of exercising and end up gaining back the weight and losing the strength and fitness level I’ve worked all these months to gain. My biggest sadness is that I’ve begun to genuinely enjoy my running and I’m already missing it. My husband is getting ready right now to head out for “our” early Saturday run and I am sad that I will be sitting here while he is out in the fresh air pounding the pavement. I know for the time being I need to drastically limit the exertion I put on that leg. I finally have the swelling down a bit and don’t want to aggravate it again. There is a fitness-minded motivation group I am part of on Facebook, and one of the gals had recently posted a 30 Day Arms Challenge. I decided I’m going to give this a try, now is a good time to focus on my upper body strength and I should be able to do this without much impact to my legs. This is the challenge, I am only on day 3 and I am already feeling challenged, lol! For more of a cardio type burn, I think that swimming will be my go-to for a while. However, until I see the doctor and know exactly what type of injury I’m working with, I’m reluctant to even work those legs in the water. Thursday morning I went for a swim and put a floaty-noodle under my chest and another smaller one under my ankles and did my laps with just my arms. The key I am trying to remember is that I made a decision to change my life, to become healthier, fitter, stronger and happier. I am NOT going to let a road block stop my progress, it will just send me down a different path for a while where there is still plenty of room for growth. June ended up being a whole different kind of month in regards to my fitness activities. In previous months, I had been mostly walking on my treadmill and was tracking and tweaking each month details like my starting speed, max speed, duration, and adding in small amounts of jogging intervals – each month slowly increasing the duration of those intervals and slowly increasing the speed as well. So how was June different? 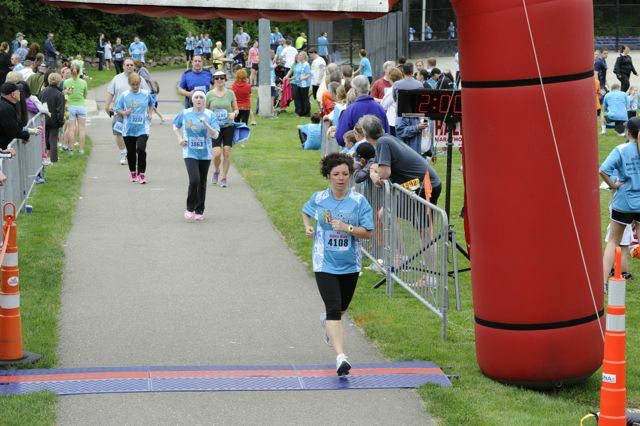 June was kicked off by running the Kona Run 5K Race. This was a big goal for me. I had completed a 5K once before, in 2012, and I mostly walked it, finishing in just over 47 minutes. This time, I ran just about the whole 3.1 miles. I did take a few short walk breaks but for the most part I ran the whole thing. (Well, maybe jogged would be a better description.) My finish time was 38:14 which to me, is amazing! This was a real eye opener to me, that I was ABLE to run over 3 miles. And this changed the dynamics of my workouts in the month of June. My scheduled walk/run days turned into more running than walking, and further distances than I did in the past. With the recent acquisition of my Garmin Forerunner 10 GPS watch, I also did a lot more of my workouts outdoors. What I found that was really different about this was my pacing. On my treadmill, I have full control of my pace. I set the speed on the treadmill and go, and my speed only changes if I adjust the speed of the treadmill. But on the street, I go…well…however fast my feet take me. Granted, I can use some tools on my Garmin to set a pace and be alerted if I am going above or below it, but for the most part it is much more difficult to control my speed. 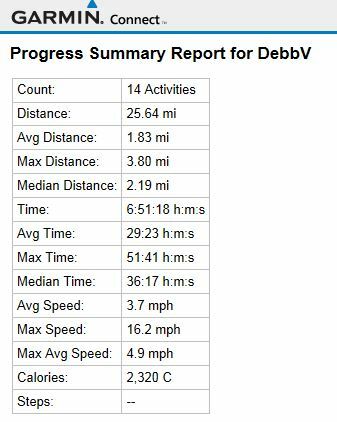 Consequently, I ended up walking and running much faster on my outdoor runs in June than I had been doing previously on the treadmill. Being outdoors often pushed me to also increase my distance/duration. The further you get from home, you still have to go that distance to get back. It’s not like being on the treadmill where you can just press the stop button and step off. In previous months, I pretty much just walked on the treadmill. With the tiny intervals of jogging. But for the most part treadmill was what I would do, and I would do it 3 or 4 days a week. This month I was actually trying to follow both a walking/running training program and also a strength training program. These were guides that were included in that book I had been reading, The Salt Solution. The interesting part was that each week the duration times were increased, to the point where it was 45 minute intervals, 50 minute steady-states, 40 minute power walk, and an hour and a half recuperative. I had a hard time keeping up with the duration increases and found myself modifying this as the month went on. The strength training was a 3 days per week program. It was a routine of 7 exercises and the program called for a certain number of reps and sets. For example, week 1 was one set of 10 reps of everything. By week 5 the first day you’d do 3 sets of 15 of all the exercises, day 2 was 3 sets of 12 reps, then 3 sets of 10 reps. The exercises were things like squats, chest press/fly with small hand weights, lunges, bent-over rows with the hand weights, dead lift curl presses, bicycle crunches and planks. I followed this plan pretty closely all month so I was working out an average of 6 days per week, some days were both running and strength training. And I got in a good swim also about 2 days per week. With the addition of the Garmin to my fitness toolbox, I am now able to more closely track and report on my fitness activities. Unfortunately, I didn’t realize until close to the end of the month that I could manually log activities that I didn’t use the Garmin for. So here is a glance at how this tracking looks, minus some activities like the strength training and early month treadmill runs. However, my street running was more like an overall average of about 4.5 mph and this included my walking. I was typically walking at just over 4 mph and my running was a little over 5 mph. I logged a total of 42.47 miles in the month of June, averaging 10.5 miles per week. 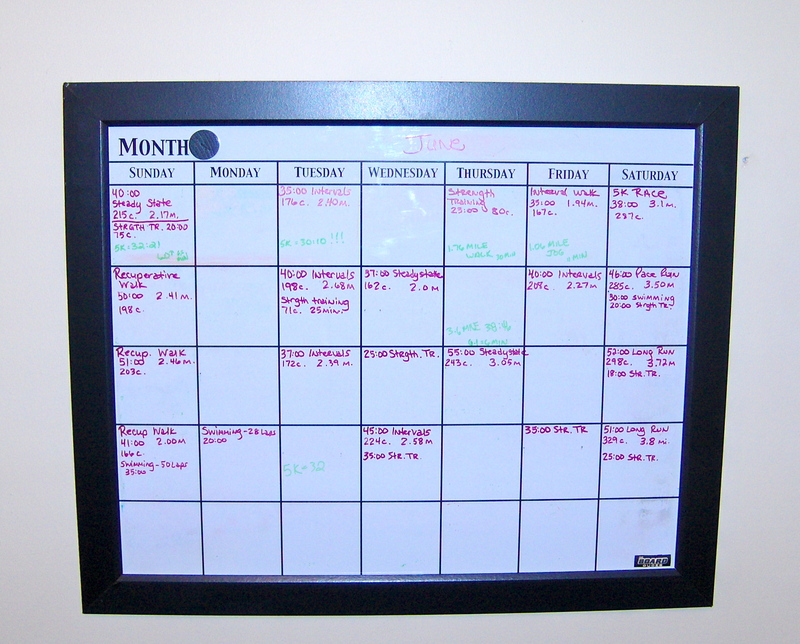 My whiteboard calendar in my workout studio – the purple entries are mine (green is Jim’s). June was a very FULL month of training! 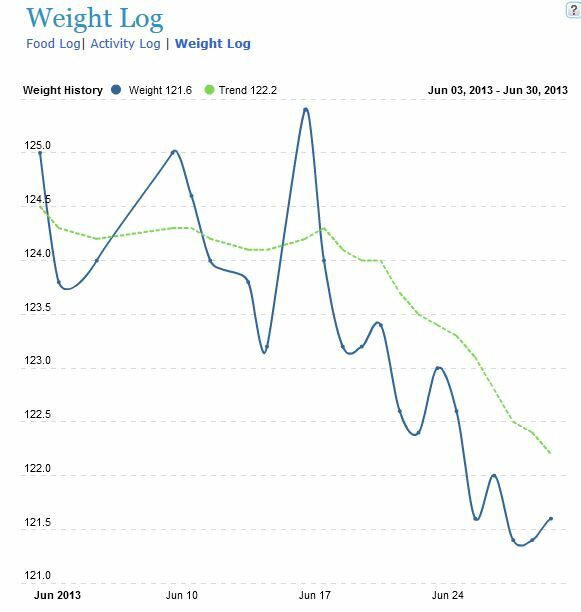 Was kind of surprised to see my weight keep going down this month. I was actively working to adjust my calorie intake to a higher level for “maintenance”. But it really wasn’t until the end of the month that I started taking in much more calories than normal, so with all that activity it’s no wonder I kept losing weight. Technically I did want to get down to 120 lbs, but had been thinking I’d save those last few pounds until after I stand up in Terri’s wedding in July. I don’t have much room to work with to maintain the perfect fit on that bridesmaid dress. But I guess a pound or two one way or the other won’t make much difference. Resting is hard work. Mentally, it can be challenging to shut down the momentum of several days of great workouts just to let your body rest. I have a real struggle with this at times. Intuitive rest days are easy for me. Those are the days when I absolutely feel like I need to rest even though there is a workout on my “schedule”. The days when I am not feeling well, or have an injury, or for some reason just do not feel like I am going to be able to do the workout I had planned. I’ve become very flexible and forgiving with myself when I feel like I need rest. Listening to my body has become a bit easier for me than it used to be. Scheduled rest days are where I have the most trouble. Monday is my scheduled rest day. This is largely because I don’t work weekends, so it gives me lots of time to get really good workouts in. By the time Monday comes around, I have often worked out 3 or 4 days in a row, and my body truly needs rest time to recover. The problem is that I seem to build momentum, the more days I workout in a row, the harder it is to put on the brakes because I get “on a roll” and don’t want to stop. Last Monday was a perfect example of a restless rest day. I had all kinds of energy Monday night and got it in my head that I’d like to go for a swim. I knew darn well that if I got in the pool I was going to swim laps and not just lazily float around and relax. My husband tried to remind me that it was my rest day and it would probably be a better idea for me to, well, you know….REST! In my stubborn little brain I managed to rationalize it like this: if I am in the mood to do an activity that sounds like fun and I just want to do it, and it is not a specific training that is on my schedule, then I should go ahead and do it right? Resting is just taking a break from my scheduled training right? Wrong. Rest is giving your body time to recover and rebuild from all the exertion you have put it through in your days of training. You cannot keep tearing down your muscles and expect them to keep performing if you don’t give them time to rebuild. So on my “rest day”, I decided to head up to the pool around 8:00 p.m. Against my husbands good advice. I had been swimming laps for about 10 minutes when I started hearing loud rumbling coming from the sky. 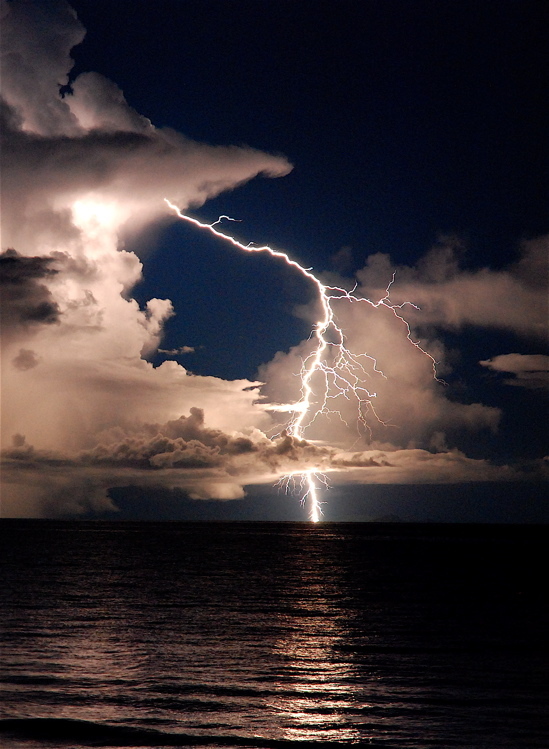 I looked up to see the sky filling up with thick grey clouds punctuated with quick flashes of lightning. There was, however, a nice little patch of clear blue sky directly overhead – which my stubborn brain used to rationalize that there was no reason to get out of the pool. A few minutes of swimming under the sounds of rumbling in the sky and a concerned neighbor came up to the fence. She asked how the water was. And as we made small talk she kept glancing at the sky, then back at me. Finally she asked if I’d noticed the lightning. I assured her if I saw much more of that, then I would get out of the pool. Shortly after this I looked up and saw my husband Jim standing at the gate of the pool looking at me with concern on his face. He thought the threatening weather might be a good reason for me to get out of the pool. “Just 4 more laps and I’ll be done”, I told him. I felt like a child begging for more play time from a concerned parent. As I came back to that side of the pool from the next lap, I looked up and found Jim still standing there. With so much concern on his face, I don’t think I’d ever seen him look at me like that before. So I got out of the pool. Walking back to our condo, we joked a little about how would he explain to people if I had been hit by lightening in the pool just minutes after he asked me to get out. I teased that now I would only get to log that I did 28 laps instead of a nice even 30. His reply was “Go ahead and log your 28 laps, but make sure to tell the whole story of how your husband saved your life tonight!”. So here is my tribute to my loving husband, who saved my life on my restless rest day. Now, clearly you could construe this post as being about the perils of swimming during a lightning storm. But no, that is actually not my point here. My point is that I really needed to rest my body on that day (even though I didn’t feel like I needed rest) and instead I allowed myself to be foolish just to, what? I don’t know, prove that I could keep going day after day after day? I don’t know what I thought I was doing. But I do know that I woke up the next morning with an overuse injury in my groin muscle and my right calf. And I couldn’t do my scheduled run that night and was forced to take a rest day. And another the day after that. In the end, my restless rest day cost several days of training from my week and a fair amount of needless pain from overexertion injury that could have been avoided by giving the Rest Day the respect it deserves. My dad taught me the importance of having the right tools for the job. 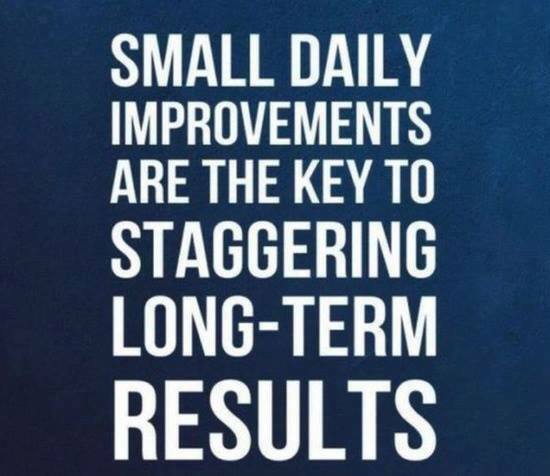 This holds true for fitness as much as it does for any thing else. Now that I’m doing more running outdoors, I decided it was time to invest in a summer running outfit. I had a total of two outfits for running. One long sleeve, hooded Tek shirt with mid-calf capris that I bought to do my first 5K. That race was in March and I was expecting it to be quite cold. 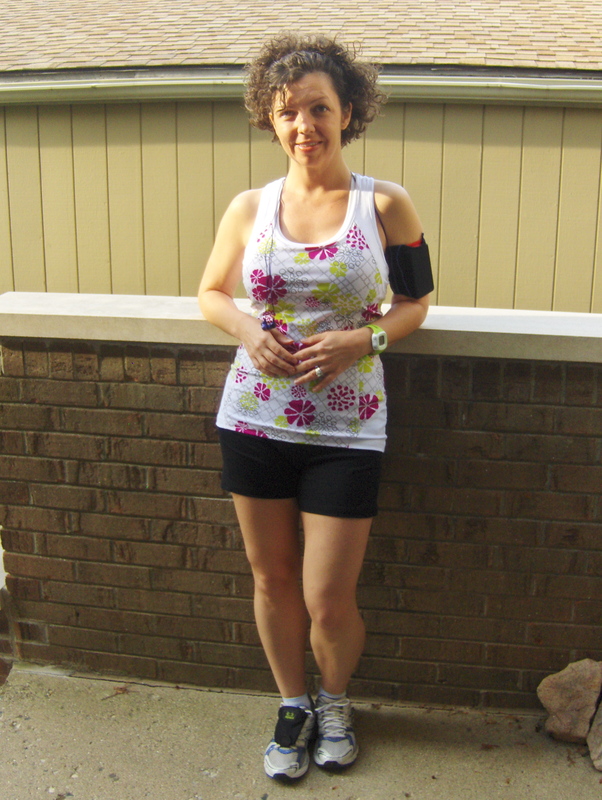 The other I picked up on sale at the Running Fit store and it is a fitted tank with knee-length capris. This summer I decided it was time to invest in a lightweight running tank made of wicking fabric, and I wanted some running shorts (now that I actually have some shape to my legs that I don’t mind showing off a bit!). I had a lucky break in that I finally got a 30% off coupon for Kohl’s, and they had their Tek Gear marked down 40% off. My new summer Tek Gear, along with some fun running gadgets! Here is what I got, and I really enjoy having this now that I’m running outside in hot, humid weather. I’ve also recently acquired a Garmin Forerunner 10 so I can track my miles, pace, time, and calories burned – and when I come back in I can upload it and see my run on a map with elevation and all kinds of cool charting and tracking info. Finishing touches for the perfect outside run include an armband to hold my iPod and a little pocket attached to my shoelaces to hold my house key and anything else I may feel the need to take with me on a run. These little additions to my fitness wardrobe have made my outdoor running experiences MUCH more enjoyable! Do not underestimate the value of having the right tools for the job. In keeping with this concept, I also purchased a new swimsuit. I have rediscovered my love of swimming and am making more and more use of the pool at our condo. The problem with this was I had a drawer full of old swimsuits and they pretty much all fell into two categories. 1. The skimpy bikini’s from when I was twenty which I now have enough sense and modesty to know there is no good reason for me go out in public in these suits! Not to mention, they pose a constant risk of ‘wardrobe malfunction’ while swimming laps in the pool, lol! 2. The “fat-suit” variety which are the couple of suits I bought to try to wear when I was much heavier and they were designed to cover as much as possible and are all too big for me now anyway. The idea of going shopping for a new bathing suit was not one I looked forward to. I ended up being very pleased to find EXACTLY what I needed, at Kohl’s, where I was also able to use my 30% off coupon and it was on sale! This suit is by a brand called Zero Xposure and it is very sporty/athletic – just what I needed! The top is guaranteed to keep everything in place, and the bottoms have a regular bikini bottom but then have shorts over it that are like little Nike type shorts. I realize this picture did not come out as the most flattering one ever taken, but this suit actually looks really cute on me and covers everything it should, and stays in place really well while I do laps. I love it! Having these new additions to my fitness “toolbox” really motivates me to get out there and stay active! As you’ll read more about in a post coming soon called Restless Rest Day. 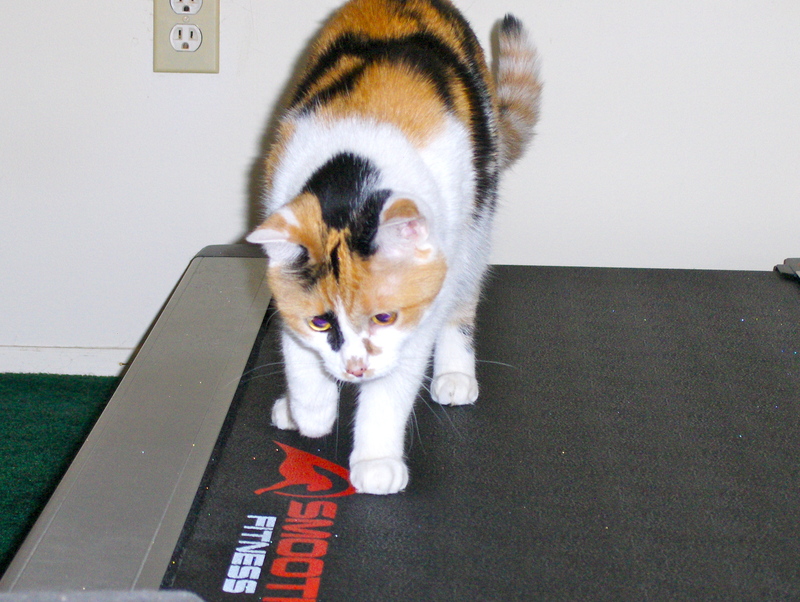 This is my cat, Patches, scoping out my treadmill the other day while I was in my workout studio doing my strength training. 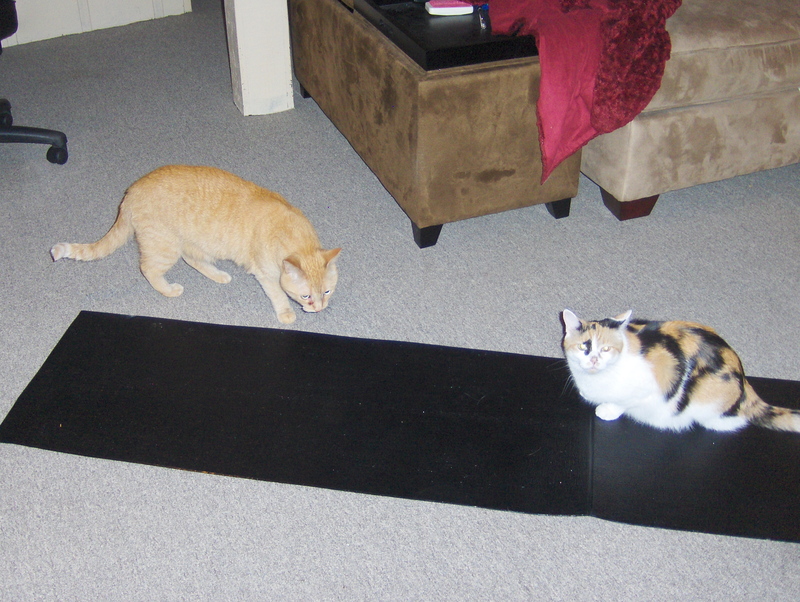 This got considerably more cute after Jim came in the room, and turned ON the treadmill, lol! And this I just had to snap a picture of because it was so funny. My husband, Jim, is doing a 30 day Ab Challenge this month and has recently started using the mat that came with my AeroPilates machine to do his workout on. Within seconds of him laying out this mat, our cats come running and are drawn to it like a magnet. I mean seriously, the cats can be anywhere in the house but somehow they sense that he put this mat down and they just have to come and get on it! It certainly wouldn’t hurt these two to join the 30 day Ab Challenge! They are clearly not underfed, lol! What better way to start a Saturday morning than a 3.50 mile run before breakfast!? I really love the weekends when I can get my run in early in the morning. (I’ve yet to be able to get up early enough to do that during the work week.) It gives me a burst of energy to power through the day, and I like having it done and over with so it’s not looming over my head all day like an unfinished chore. It has become habit for me now on Saturday and Sunday mornings to hit the treadmill around 7 or 8:00 a.m. before I even make breakfast. It’s funny how at later times in the day, I need to time my workout well within a certain range after a meal or else I end up running out of fuel for the workout. Yet, first thing in the morning before eating anything I can power through just about any workout as long as I do it very soon after waking up (usually within 30 minutes of getting out of bed.) If I wait much longer than that, I start to get hungry and don’t have quite the energy-fuel my body needs for a good run. My husband has often commented that he doesn’t know how I can work out first thing in the morning on an empty stomach. But this weekend he decided he wanted to give it a try, so we laced up around 8:00 a.m. and headed outside for a good run together. Today was my “long run” so I decided to go 3.5 miles, which so far is the longest I’ve ever run. And I actually RAN pretty much the whole way. I did allow myself a 1/4 mile brisk walking break after about 1-3/4 miles while I was heading up a big hill. And on the last mile there were a few uphill stretches that I walked. But for the most part I ran it!! When we got home, Jim suggested we head to the pool to cool off. There is a nice pool at our condos, but we don’t typically use it much. Most of the time that I consider using the pool, it is either not open, or is filled with children. This morning we had the whole pool to ourselves and we did 30 minutes of laps. The water felt so refreshing after that run! I really liked the idea of adding more workout to my day, while doing what actually felt like a cool-down to the run. It was nice and low-impact on my knees, yet was strenuous and challenging and I ended up burning almost as much calories swimming for 30 minutes as I burned on my 46 minute run! To my surprise, within a few hours, I became very sore. I mean, really, really sore. My arm and chest muscles, basically my whole upper body, was screaming at me! I hadn’t fully considered what a strong upper body workout it was to swim laps and apparently the small amounts of strength training I’ve done in the last few weeks has not been enough to prepare me for swimming laps. But, I was determined to be in full “beast-mode” today and I still stuck to my 25 minutes of strength training that I had planned for this evening. It was hard, but I felt very accomplished after completing it. There is something that just feels so good about doing something physically challenging, especially when you don’t feel like you can do it. Getting it done feels like a big win! My eating was a bit off the charts today, but I did use a certain amount of restraint. After all this running and swimming we cleaned up and headed out to see a movie at the theater that we’d been wanting to go see (the new Star Trek movie, was really good – I highly recommend it!) and we were both so hungry we knew we needed to grab lunch somewhere before the movie. The eating went a bit downhill from here. At the theater I indulged a bit because, well…just because part of the “going out to the movies” experience is eating junk food! But I kept it in check for the most part, I got some water instead of soda (I don’t normally drink soda anyway, but it seems more tempting when I’m out somewhere like that), and I got a box of chocolate covered raisins (my favorite movie snack!). Before even opening the box I checked the nutrition facts label and sure enough they claimed there were 2.5 servings in the box! And each serving was 180 calories. So I was careful to only eat what I believe was about 1 serving and left the rest in the box. Said box of chocolate covered raisins is currently sitting on the desk next to me testing my resolve. I expect that box to land in the garbage soon before I am tempted to finish it off. On our way home from the movie, we grabbed some sandwiches from Subway to have on hand for dinner. It really is nice every now and then to take an entire day off from cooking! And again I went for their Turkey Bacon Avocado sub on 9 grain whole wheat bread. I really love that combo of flavors, and I realize I could have saved substantial calories by skipping the bacon on both sandwiches but come on, every one loves bacon right!? After dinner we were craving dessert, I did indulge but was careful on the portion sizes. I had 1/2 a Vitatop deep chocolate muffin top. (These things are seriously delicious, taste like a chocolate brownie, but they are PACKED with vitamins and nutrition and they are only 100 calories!) And we still had some ice cream left in the freezer that my mother in law had brought over when we celebrated Jim’s birthday a couple of weeks ago. So, I had 2/3 of a serving of the ice cream with it. So just by only having partial servings of each of those I shave off about 100 calories from dessert from the standard serving size. And considering most people typically serve themselves much more than what the product describes as a serving size, I think I did really well. I’m only including all this detail about the food today because of my last post where I talked about my struggles with sweet treats. I’ve decided that if I really want it, I’ll let my self have it and I’ll enjoy it. BUT with that comes some responsibility on my part to closely monitor my serving sizes, and to make sure I am burning the necessary calories to balance it out. My normal daily calorie target is 1350 and today I ate 1708. However, I did so much exercise, that I burned over 600 calories. I closed out the day with a -197 calorie deficit, so I do not feel one ounce of guilt over today’s eating.